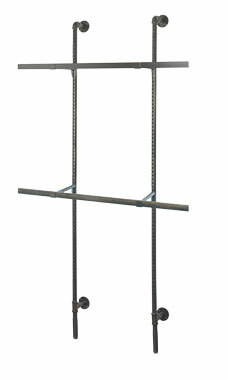 The Boutique Pipe Outrigger System Kit 4 is the perfect way to display merchandise on your walls! This kit includes everything you need to create the image shown in your store. The pieces included are (2) Boutique Pipe Outrigger Uprights (60702), (2) Boutique Pipe 4 foot Dimensional Hangrail (60714) and (4) Boutique Pipe 12 inch L-Shaped Hangrail Bracket (60712). Assembly required.